Female WWII Pilot Elaine Harmon Laid To Rest At Arlington National Cemetery : The Two-Way Elaine Harmon was a WASP — a woman flying military planes to free up a male pilot for combat. WASPs have received veteran status, but the Army had ruled their ashes couldn't be placed at Arlington. 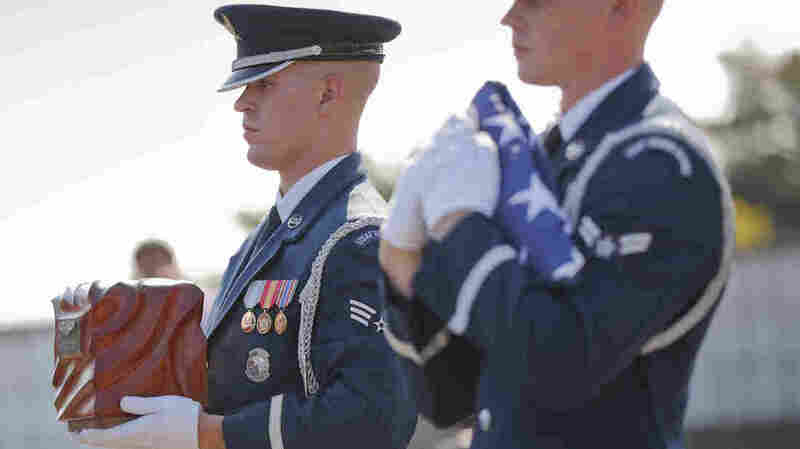 The U.S. Air Force Honor Guard carries the remains of World War II pilot Elaine Harmon during services on Wednesday at Arlington National Cemetery in Arlington, Va.
World War II pilot Elaine Harmon, who died last year at the age of 95, wanted to be laid to rest with her fellow veterans at Arlington National Cemetery. And on Wednesday, Harmon's wish was fulfilled — thanks to a dedicated effort by her family and a law passed by Congress. Harmon was one of the Women Airforce Service Pilots, a group of female pilots who flew military planes in noncombat missions in order to free up male pilots for fighting. "We had exactly the same training as the male cadets — some of the women ferried airplanes, some towed targets," she said. "I was in a tow target squadron, training the boys at Fort Bliss ... and they were shooting live bullets at our targets. Fortunately they did not hit our planes, but they did not hit the target every time either." In fact, 38 WASPs died serving their country. But as NPR's Susan Stamberg has reported, they were regarded as civilians. They paid for their own pilot training. The military was not required to pay for funerals, or even just for remains to be sent home. And when the war was winding down, the WASPs were dismissed and their jobs were given back to male military pilots. The WASPs had been promised they'd receive military status, but during the war, they never did. "The only reason was because of sexism," Rep. Martha McSally, R-Ariz., told Here & Now. McSally was the first female U.S. fighter pilot to fly in combat. "I mean, the men who were doing the same roles before, alongside and after them, they were military. 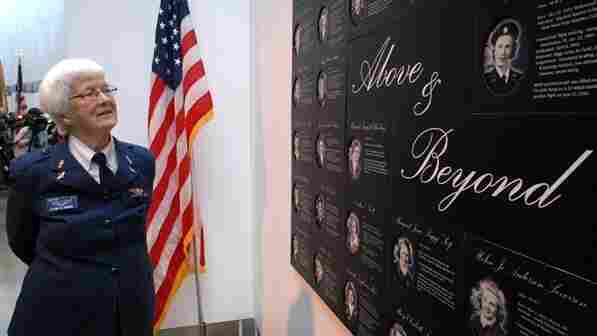 These women should have been active-duty at the time," McSally says. It was decades before the women were retroactively granted military status. They were acknowledged as veterans in 1977. It took decades more — until 2002 — before WASPs were allowed to be laid to rest at Arlington with full military honors. Elaine D. Harmon, a former pilot of the Women Airforce Service Pilots program, walks through the "Fly Girls of World War II" exhibit in 2008 at the Women in Military Service for America Memorial in Arlington, Va. Harmon was laid to rest at Arlington National Cemetery on Wednesday. After Harmon saw the first such funeral, The Washington Post reports, she knew that's what she wanted. But a month before she died, then-Army Secretary John McHugh decided that WASPs did not qualify for inclusion at Arlington — and never should have. The military cited limited space. As The Associated Press notes, "eligibility for in-ground burial at Arlington, which has severe space limitations, is extremely tight, and not even all World War II veterans are eligible for burial there. But eligibility for placement of ashes, or above-ground inurnment, is not quite as strict." McSally called it a "cruel injustice" for the Army to decide that no WASPs could qualify for inurnment. "I realize that at some point they are going to run out of space at Arlington. We understand that," she said. "But look, when we are totally out of space ... why would we not want to have the story of the WASPs as part of that legacy?" Harmon's relatives appealed for a change in policy, the Post reports. A petition on Change.org gathered more than 175,000 signatures. Then McSally introduced legislation that would require the cemetery in Arlington, Va., to make WASPs eligible for inurnment. The bill passed in May and was signed into law by President Obama. And on Wednesday morning, Harmon's ashes were inurned in a funeral with military honors. "It sounds funny, but we're all kind of excited," Harmon's daughter told the AP before the ceremony. "In a way, we've already grieved, and this now is about closure."